Have the Microsoft People Broken the Windows? Should You Choose to Buy a new Windows Powered Machine Now? report an interview with Tami Reller, chief marketing officer and chief financial officer of Microsoft’s Windows division, in which she discussed users' frustrations with company's new(ish) Windows 8 platform. Like many others, I've experienced these issues myself. As Ms Reller says, things are particularly awkward when using the new tiled user interface with a screen which isn't touch sensitive. How Big an Own Goal is This? The problem is that the retail channel is stuffed to bursting with PCs that don't have touch sensitive screens. Over 80% of the PCs in an ad hoc survey of PC World this week were not touch sensitive. 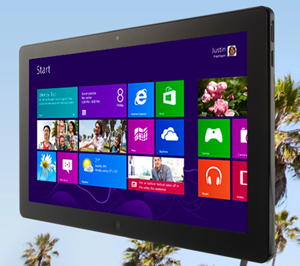 One user has clearly tossed this frustrating Microsoft Surface tablet towards some tropical trees! These machines work nicely with the older Windows 7, but the unlucky retailers have to try and them sell with the touch interface. But is that soon enough? And will the new version be comfortably usable with and without a touchscreen? Ms Reller's comments, combined with a 14% drop in PC sales and the revelation of Windows painfully small share of the tablet market, represent an admission that the current version of Windows is effectively a write off. While Microsoft's market presence is truly colossal, this time they have taken a significant self-inflicted wound. The short answer is - not if you don't have to. you might access Windows applications remotely by virtualising your Windows environment and accessing it from an Apple or Android tablet. you might go for something secondhand as that way you can get an optimised Windows 7 machine now which should last long enough for you to wait and see how things develop. We have a range of Windows tablets compared here, but the bloated Windows platform means that they are expensive and perform poorly when set beside the Android and Apple alternatives. If you do have to get something fairly light and Windows-powered, perhaps the best option is a touchscreen ultrabook - these are lighter, more robust (and more expensive) laptops with a solid state disk (SSD) instead of the traditional spinning disk. (Sometimes they have both an SSD and an HDD.) Some of the newer models are compared at this German site. For larger desktop PCs, when they have separate monitors, there is the option to get a touchscreen monitor now to use with Windows 8. For domestic users it is quite hard to buy a new PC running the older Windows 7 platform. Much the better option would seem to be to go for a high-powered secondhand model that's already running Windows 7 (and has the appropriate licences). This way, if you find next year's touchscreen Windows offering sexily enticing, all you need do is buy a separate touchscreen monitor and upgrade. It's not really such a good time to buy a non-touch laptop. As people become more accustomed to tablets, it comes to feel natural to touch the screen, which is, after all, closer to you when you're using a laptop. Beside the tablet that I'm using to write now, I find my laptop increasingly frustrating to use. Aside from the touch interface issue, it also seems heavy, noisy, hot, power-hungry and fragile. I can't turn it around when I want to look at something in portrait and the keyboard isn't illuminated. And it can't be modified next year by fitting a touchscreen. These machines really have had their day. If you have to buy one, you should be budgeting on it having paid for itself completely inside a year to eighteen months - so again, going secondhand looks the best option.